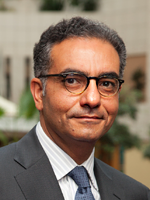 Fadi Chehadé was the President and CEO of ICANN from 14 September 2012 until 10 March 2016. He built a strong executive leadership team that transformed ICANN from a Los Angeles-based organization to one with a global presence with staff in 25 countries and services offered in seven languages. In 2014, he presided over the most significant milestone in ICANN's history: the United States government's announcement that it would transfer stewardship of the IANA functions to the global Internet community. This step forward is the realization of a longtime goal for the United States and a recognition of ICANN's maturity as a global organization. That same year, the first registries from the most recent round of new gTLDs came online, commencing the largest-ever expansion of the Domain Name System. Meeting on the Future of Internet Governance in April 2014, bringing together diverse stakeholders to create a shared set of principles for the evolution of Internet governance and cooperation. The following year, he advanced ICANN's involvement as a founding member of the new NETmundial Initiative, a multistakeholder initiative to energize bottom-up, collaborative solutions in a distributed Internet governance ecosystem. Chehadé is a citizen of Egypt, Lebanon, and the United States. He was born in Beirut, Lebanon, to Egyptian parents and left the then war-torn country in 1980 at the age of 18. He speaks fluent Arabic, English, French, and Italian. Before joining ICANN as its President and CEO in late 2012, he served as Chief Executive Officer of Vocado LLC, a U.S. firm that is a provider of cloud-based software for the administration of educational institutions. Chehadé founded and has led three companies since 1987: Viacore, launched in 1999, was the world's leading B2B process integration hub offering a complete solution of specialized software and services for global 500 companies. In 2006 he led Vicaore's successful acquisition by IBM. RosettaNet, a non-profit multistakeholder company founded in 1997. Chehadé rallied all the leading ICT companies in the world including IBM, HP, Microsoft, SAP, Nokia and Oracle to collaborate on B2B standards. RosettaNet became the high-technology industry's leading eBusiness standards consortium. RosettaNet adopted a multi-stakeholder approach to define and standardize a complete inter-company process language, enabling the ICT sector to use the Internet for real-time process synchronization between thousands of trading partners. Nett Information Products, launched in 1987 to create and develop an Internet-based content management and sharing solution, successfully weaving hundreds of ICT suppliers and thousands of their resellers into a powerful collaborative business web of applications and content. Ingram Micro the world's largest ICT distributor acquired Nett, where Chehadé became vice president of its Customer Information Services Group. Fadi is also the founder of Nilorado, a youth organization raising funds to support schools for handicapped children in Upper Egypt, also delivering bicycles to boys and girls from needy families in that region who otherwise cannot reach their schools.